In the post-war period, and in particular after the proclamation of the Republic in 1946, the unity of the political forces that had fought Fascism came to an end. On one side, the normal democratic dialectics, based on the principal of a majority and an opposition party, was resumed, but on the other, the conflict between the "center" and the "left" was unquestionably fostered and particularly aggravated by the international atmosphere of the "cold war". This framework must be kept in mind in order to understand the wide-spread popularity of a group of stories by the humorous writer, Giovanni Guareschi, collected into a volume with the title of "Mondo piccolo" (Little World). The setting was a small farm town, Brescello, in the Po Valley (in Emilia-Romagna). Here lived the two leading characters, sword enemies: the Communist mayor, Peppone, and the parish priest, Don Camillo. In a place like the Romagna district, where there is an ancient tradition of leftist thinking, but also a strong Catholic tradition, Guareschi turns the two characters into the mouthpieces of two contradictory worlds, as experienced however in a small country town where everybody knows everybody else and where no one has ever put their nose out of what is, in fact, a "little world". Guareschi was rightly criticized for having in any case oversimplified the dialectics between the different positions and reduced what was at the time an often inflammed struggle to little more than an opera buffa. Guareschi, however, was a humorist, not an ideologist, nor a politician or historian, and is involved in his world (which was a real town where he lived) more with his heart than with the arms of reason and criticism. He is deeply familiar with Romagna, a land of high passions, and one senses that his characters, from the largest to the smallest, spring from a direct contact with real models. 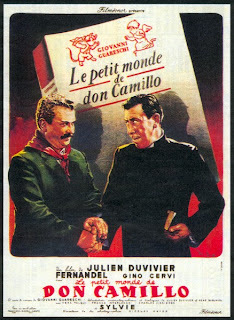 In 1952, this book, so perfectly Italian, not to say regional, was brought to the screen by a typically French director, Julien Duvivier (who in the '30s had directed several fundamental examples of "film noir" like the romantic and desperate PEPE-LE-MOKO), and a protagonist no less typically French, Fernandel. The film was called DON CAMILLO. Fernandel, with his burly peasant physique, his long, appealingly ugly horseface, was the ideal actor for the rough and impulsive priest. Peppone, the mayor, was played instead by an Italian actor, Gino Cervi, hulky and good-natured, another perfect choice. The contrast between the two men, so distinct in their respective roles, but deep down inside ready to give each other a hand and bound by deeper feelings of friendship and mutual respect than they are prepared to admit, brought back to films the Italian tradition of stock-characters of the "commedia dell'arte". There were two sequels: IL RITORNO DI DON CAMILLO (THE RETURN OF DON CAMILLO) in 1953, directed again by Duvivier (with a first-rate sequence of the flooding of the Po, in which documentary excerpts and reconstructed scenes with the actors were skillfully blended), and DON CAMILLO E L'ONOREVOLE PEPPONE (DON CAMILLO AND THE HONORABLE MR. PEPPONE) in 1955, directed by Carmine Gallone, in which the mayor leaves his job to get himself elected to Parliament (secretly helped by the priest to pass his fifth-grade exams, necessary for running for office). DON CAMILLO MONSIGNORE...MA NON TROPPO (DON CAMILLO MONSIGNOR...SORT OF) picks up the cycle several years later, in 1961, again directed by Gallone. The actors were older: Fernandel was fifty-eight, Cervi sixty. Guareschi, sole author of the story and the script, took advantage of the fact to present them further on in their careers, but weary and full of nostalgia for their youthful bickerings. Don Camillo, like Peppone, is in Rome: the latter has risen from deputy to senator and the priest has been named "monsignor" and is in charge of an important Vatican department. They go back to the village, ready to pick up the old disputes. In 1965, IL COMPAGNO DON CAMILLO (COMRADE DON CAMILLO) appeared, directed this time by Luigi Comencini. The priest, blackmailing Peppone with good intentions, has himself included, disguised as a party leader, in an official delegation of Communists invited to the Soviet Union. The political satire is perhaps a little shallow, but the film is well-concocted and no less amusing than the others. When the last film of the cycle appeared, DON CAMILLO E I GIOVANI D'OGGI (DON CAMILLO AND THE YOUNG PEOPLE OF TODAY: 1972), directed by Mario Camerini, Fernandel had been dead for a year. the illness that would carry him to the grave struck him on the film set and the producers preferred reshooting everything that had been made so far and to "invent" a new team, replacing Cervi as well. So Gastone Moschin, tall, rugged and impetuous, was Don Camillo, while the American actor Lionel Stander lent his good-natured grit to Peppone. The Don Camillo cycle certainly sprang from that shift to non-Roman peasant settings inauguared by PANE, AMORE E FANTASIA (BREAD, LOVE AND FANTASY), but was possessed of characteristics of its own. The psychological realism of the characters, the minute description of the setting fused in sudden outbursts of surrealism. Particularly effective, the idea of having the prieset converse with Jesus Christ, who speaks to him from the Crucifix in church in a tone of amiable reproach or friendly encouragement. The voice of Christ was given successively to two great stage actors, famous for their warm and musical voices: Ruggero Ruggeri and Renzo Ricci.